Is Bien Shur perfect? Bien sûr. In my 3½ years living in New Mexico, I have had but one dining experience that I could rate as perfect. I need to explain and qualify what perfect means to me in this context. This is not the mathematician’s perfect, but a subjective collection of traits that a dining experience needs to reach the pinnacle. Ambiance. Beauty. Consistency. Service. Food preparation, presentation, and taste. Originality. I need, after the visit, to not be able to get it out of my mind. 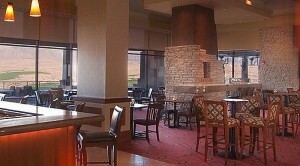 Step off the elevator on the ninth floor and walk into the dining space. Gasp at the high ceilings and gorgeous stonework. It helps that the rooms were decorated with lots of white holiday lights. Peggy. the pulchritudinous chief hostess, greets us, takes our wraps, and guides us to a table by a large window overlooking the city lights to the south and west, all the way out to Rio Rancho and beyond (ask for table number 82). In the summer, when the days are longer, you might want to sit on the opposite side with its spectacular view of the Sandias. This visual treat presaged the gustatory treat that followed. Bread: Asiago, Jalapeno Cheddar and Pecan Raisin. Hot out of the oven. 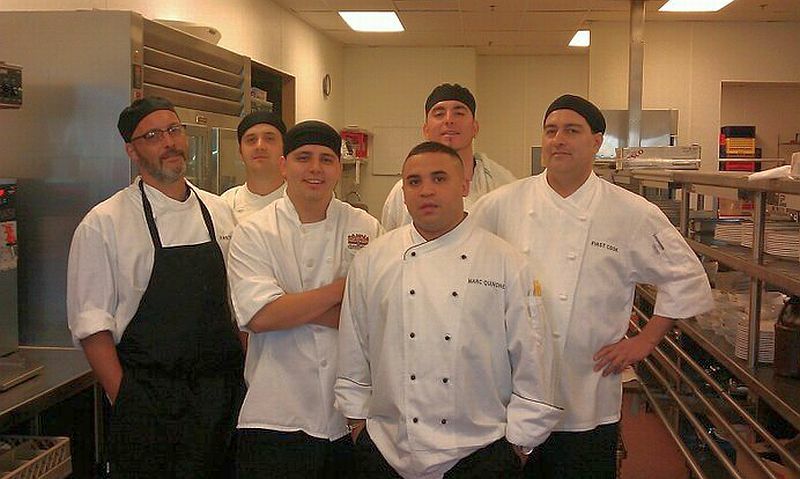 When we made our reservations, we asked that the Chef de Cuisine, Marc Quiñones, prepare a tasting menu for us. Our talented server, Shar, every bit the consummate professional, described what was about to befall us. He immediately brought a warm basket of some of the most delicious bread in town. I was already familiar with the menu, but his vivid descriptions started my salivary glands (and heart) pumping. Marc Quiñones (Bio) has transformed Bien Shur from a very good restaurant into one of the finest dining places I have ever been in. He visited our table with each entrée and added many details to Shar’s descriptions. His skill and artistry belies hid age (30). At this age, I was just finishing graduate school. Some guys have all the gifts. We started with two appetizers. Roasted Corn, Wild Mushroom Ragout, Micro Purple Cabbage, Sherry Reduction. 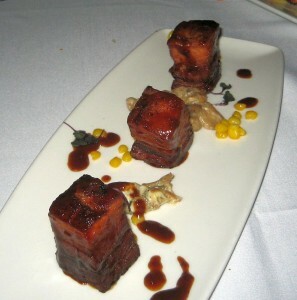 There are few places in the Duke City that serve Pork Belly. Budai serves a fabulous Dong Bo Pork (东坡肉) invented by Su Shi in the eleventh century. Quiñones’ treatment of this unusual cut is spectacular. The fat is not completely rendered out, the lean has been cooked long enough to remain tender and juicy,and the accompaniments (especially the mushroom ragout) beautifully complement the pork flavors. 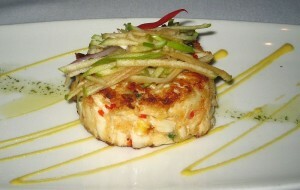 Some of you may have read that I, from the Chesapeake Bay region of Maryland, am somewhat of a crabcake snob. If it ain’t Maryland Crabcake with Old Bay, it ain’t worth eating. I relent. 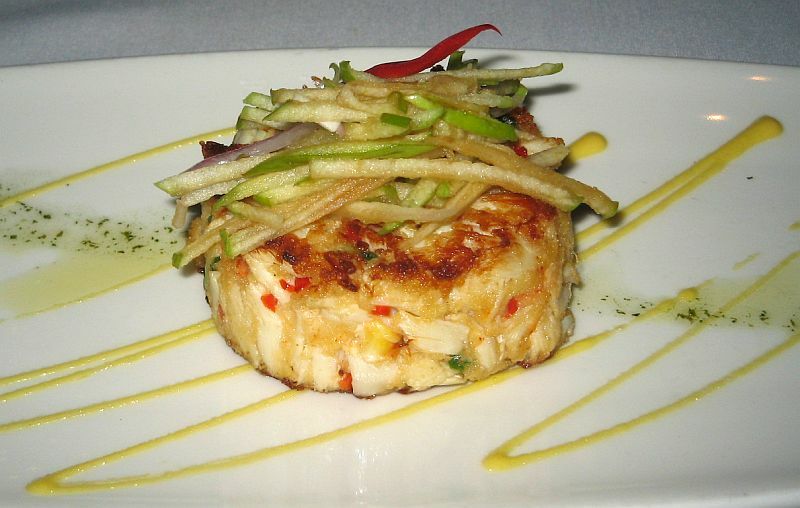 This crabcake is simple and delicious. 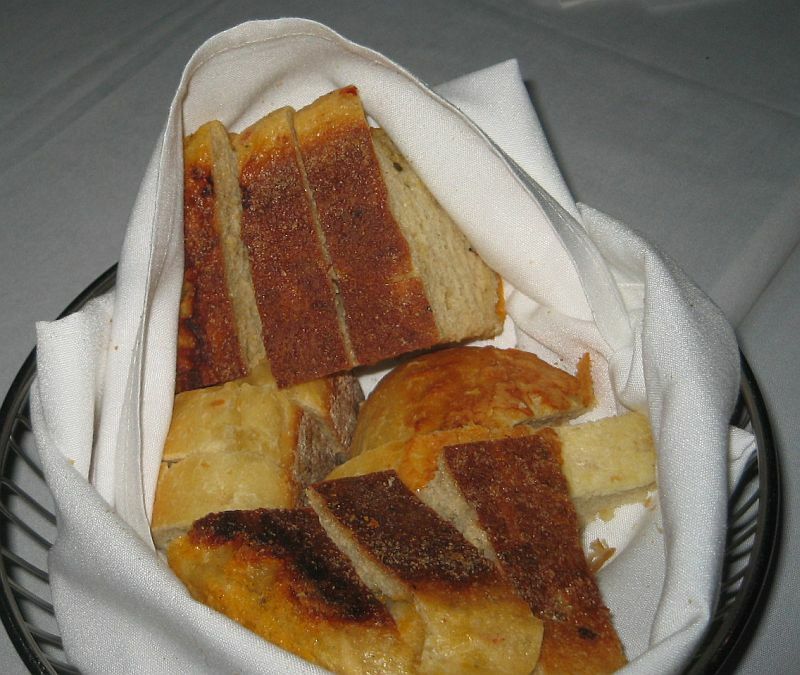 It is made from backfin lump blue crab meat that has been treated kindly and delicately. The sweet taste comes through brilliantly. 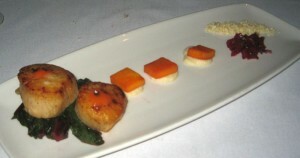 Every place in town that serves sea scallops usually does them well. The version at Bien Shur is, simply put, spectacular. Tasty, tender, and succulent. Slight crisp on the outside, and silky smooth on the inside without even a hint of rawness. Perfectly done. Best I’ve had in this town, and Jane agrees. Talus Wind Ranch is a 460-acre ranch located 30 miles southeast of Santa Fe in Galisteo, New Mexico. Humanely raised, transported and processed, their animals never see a feedlot. The result? Lamb that is tender and flavorful, animals that are well cared for, and local agriculture that is supported by New Mexicans. This small rack is better than any lamb I have had, including that we had in Iceland. Forget Australia—this is the real thing. This entrée is silky smooth and tender, and has a taste that won’t stop. Perfectly done medium rare, it outshone everything else in our meal. 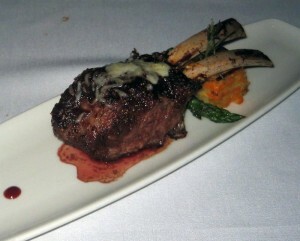 This dish is normally served bone-in, but we were offered a boneless center of the strip. Beautifully medium rare, it is juicy, beefy, tender, and delicious. It is served with a potato accompaniment that is slightly crispy on the outside and smoothly semi-liquid on the inside. You need to try this entrée in order to believe it. My words fail to pay it the tribute that it deserves . The next two entrées are prepared Sous-vide ( French for “under vacuum”). This is a a method of cooking food sealed in airtight plastic bags in a water bath for a long time—72 hours is not unusual—at an accurately determined temperature much lower than normally used for cooking, typically around 60 °C or 140 °F. The intention is to cook the item evenly, not overcook the outside while still keeping the inside at the same ‘doneness’ and to keep the food juicier. It works well. This is a huge pork chop, about 1¼-in thick, and nicely frenched. The presentation and plating is gorgeous. The taste? I may never go back to supermarket pork chops again. 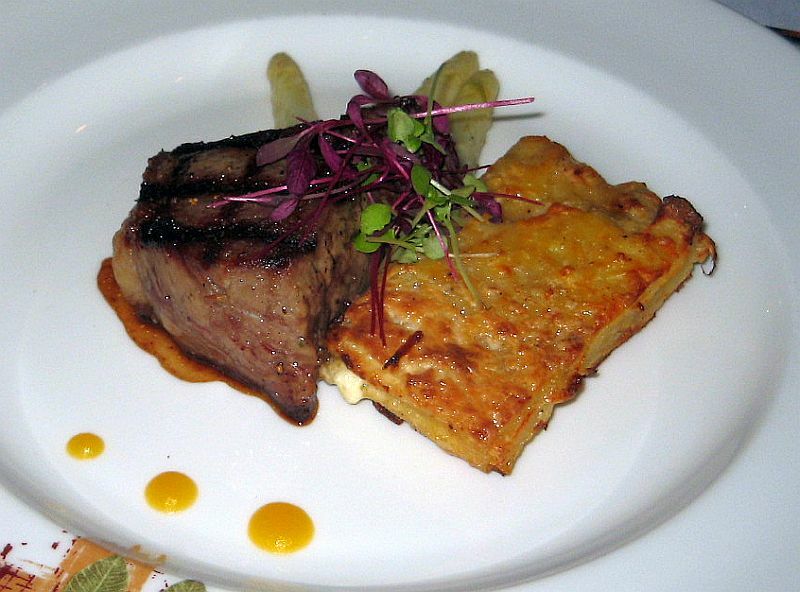 The sous vide treatment results in a chop that is uniformly done throughout, remains juicy, and is smashingly tender. The polenta is as good as it gets, and the beans are delightful. There is a subtle hint of garlic here. This dish generated leftovers which I had at home, heated very slowly in a microwave (I was too tired to fire up the warming oven) . Flavor and texture remained just fine. 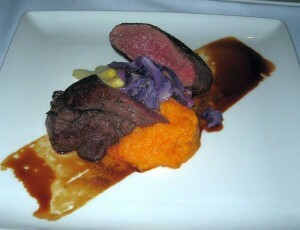 I have never had antelope before, and was concerned that it would taste gamy and tough. Not so in the hands of the brigade de cuisine here. It is tender and tasty, with an unusual but delightful taste. Once again the sous vide method worked its magic. The asparagus is crisp and tender. The sweet potato is fluffy ans quite delicious. A spectacular dish. Pork gets advertised as “The Other White Meat.” That’s not the whole story. The origins of Berkshire Pork, Kurobuta, date back almost 300 years when legend has the Berkshire hog being discovered by Oliver Cromwell’s army in winter quarters at Reading, the county seat of the shire of Berks in England. Years later, the British government gave the Berkshire hogs to the Japanese as a diplomatic gift. A strong demand was created and still exists today for the superior taste, texture and marbling of Kurobuta pork. 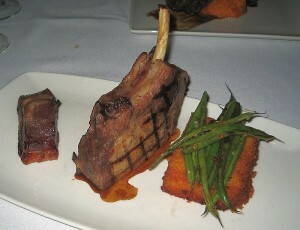 The Berkshire Belly and Kurobuta Chop served at Bien Shur are from Snake River Farms in Idaho. 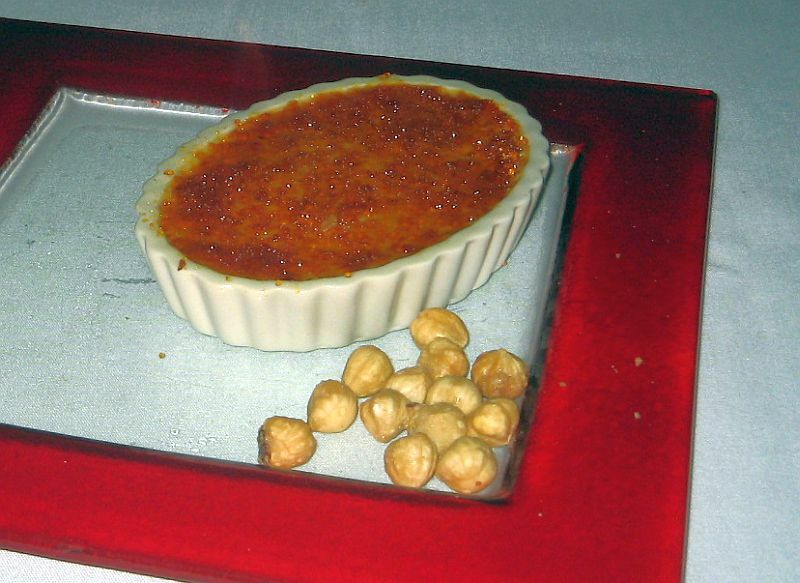 I normally shun Crème Brûlée. I rarely have anything yo do with hazelnuts or hazelnut flavoring because in the hands of non-experts, they tend to dominate everything else. .I’m wrong here. This version, which is flamed at the table, makes me eat my words. With a delicately thin crust and silky smooth interior, it is done beautifully. The hazelnut flavor is subtle, and not at all overpowering. A delightful finish. A great chef can make you like stuff that you were sure you didn’t like. Thanks for the lesson. 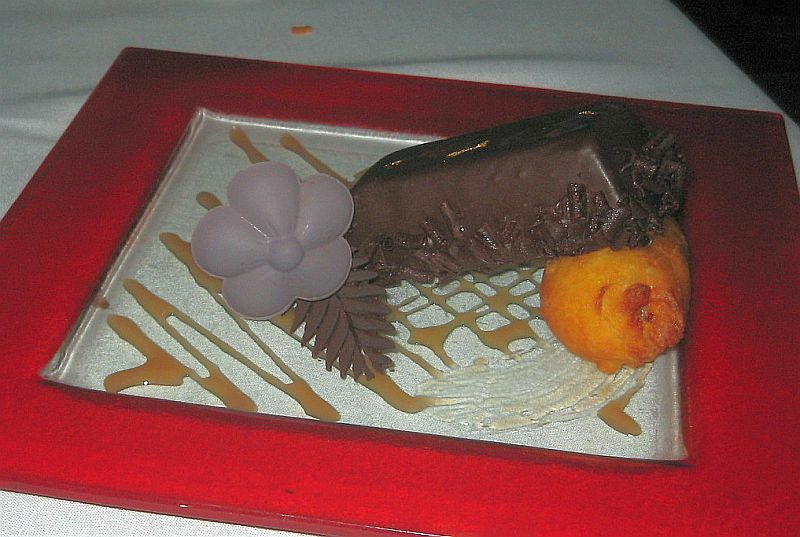 Flambéed Banana Chocolate Custard Cake coupled with a banana fritter topped with a bourbon caramel sauce. I am a chocoholic. Chocolate and raspberry. Chocolate and peanut butter. And now, chocolate and banana and bourbon and caramel. This is an exquisite dessert. It is no-holss-barred fantastic. Note in the photo that there is a lavender-colored flower sitting atop a frond with green leaves. Yup, it’s all chocolate all the way. Taste this, and listen foe the celestial voices. 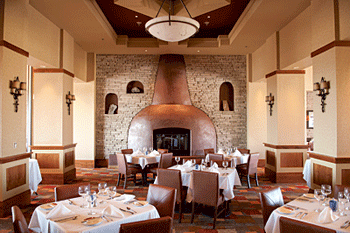 This is elegant dining at its very best, a rarity in Albuquerque. Each dish represents, to me, best-in-class. And the lamb is best-in-show. The main ingredients are carefully and brilliantly prepared. We were never asked how we wanted our meat done because the chefs know just how the dishes should be prepared for best effect and taste. The sides never competed with the mains, and the whole is a fusion of the best ingredients and techniques. Good pork is coming of age. Forget the expense. It’s worth every penny. Jennifer James served ma a Woolly Pig (mangalitsa) one night. That started a chain. Every dish is a work of art. Quiñones paints with a brilliant palette that will tickle your palate. And your eyeballs, too. Many of the ingredients are unusual and colorful. Bien Shur will soon appear on my Top Ten List. I need to visit a restaurant several times before elevating it to this lofty position. Stay tuned. On our way back from Santa Fe, I remarked that we would be talking about this meal for a long time. This entry was posted in American, Fine Dining, Seafood. Bookmark the permalink. 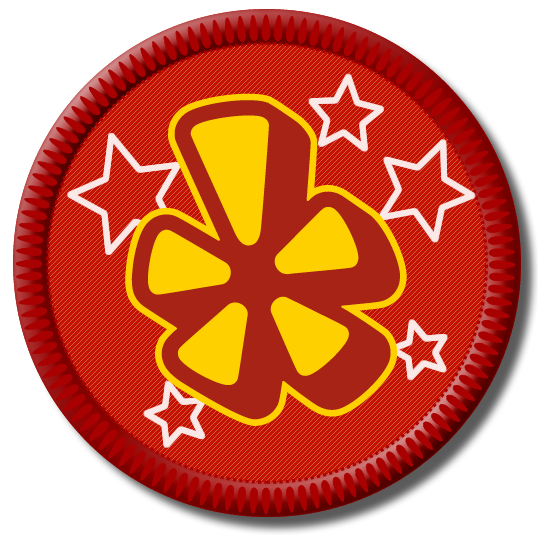 Outstanding review, Larry! Kudos for trumpeting the greatness that is New Mexico lamb and to chef Quiñones for showcasing it so well.